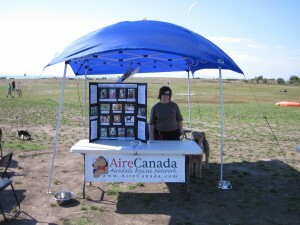 September 13, 2009 AireCanada was invited to join the Richmond BC SPCA Paws for a Cause event. Our two Airedales of course had to make the event. There were other rescue groups there also. We had some interest at our booth but mainly people want to meet Gator and Elliott (Elliott is the one you see in the photo). We met three other Airedales and had a mini playdate. This is our second event with the SPCA as we did Coquitlam last year. We are hoping to do Burnaby next year. It is great that a group like the SPCA wants other rescue groups to be recognized. See all the photos from this event.